One of your 5-a-day, this Bori is very red. The seeds are orientated horizontally rather than vertically down the body which would seem more logical to me. Definitely not one of your 5-a-day (unfortunately), the Chocolate Ixi has a much higher level of detail. I like the shavings on the legs... but is chocolate really that shiny? 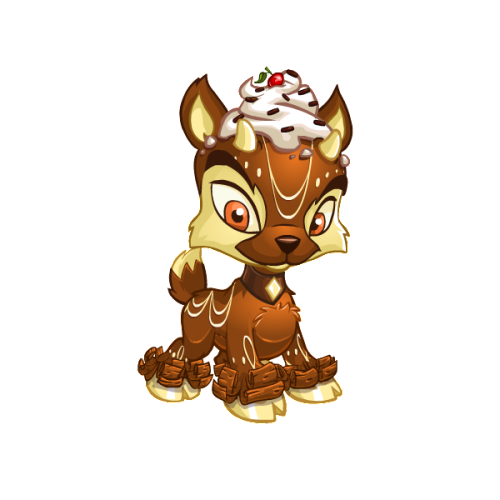 I like the Chocolate Ixi. My favorite detail is the cherry on top. I know they do that like half the time when they do the whipped cream on the head, but I love the idea of having a pet with a cherry on top. I agree about the shiny though, it does seem too shiny. The only time I see chocolate that shiny is when you melt it down with some butter to make a ganache or something. I will always be a blue evil fuzzle.